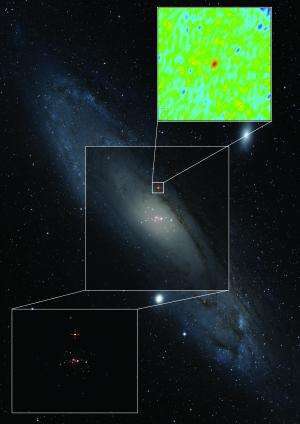 A new X-ray source (lower left and detailed in "DUBlack hole missing link Detail 1) detected in the nearby galaxy M31 ("DUBlack hole missing link Overview") was discovered to be associated with an extremely compact radio source (upper right and detailed in "DUBlack hole missing link Detail 2). The coupled X-ray and radio emission point to a stellar-mass black hole accreting above its maximum luminosity threshold. Credit: The main image, showing the optical image of the galaxy, is from the Digitized Sky Survey. The rest of the images (including the X-ray field overlay) were created by Dr James Miller-Jones, of the Curtin University node of the International Centre for Radio Astronomy Research. For the first time, astronomers have found a microquasar—a black hole devouring material from a companion star—in a galaxy beyond our own Milky Way. The object, pumping out X-rays and bright bursts of radio waves, was found in the Andromeda Galaxy, 2.5 million light-years from Earth. The discovery, scientists say, gives hope that more such objects may be found in nearby galaxies, providing them with opportunities to make detailed studies that will unravel the mystery of just how these enigmatic powerhouses—and their big brothers—actually work. In a microquasar like the one newly discovered, a black hole with a mass several times that of the Sun pulls material from its companion star into a rapidly-rotating disk. The disk surrounding the black hole can become so hot it emits X-rays. The disk also propels narrow jets of subatomic particles outward at speeds nearing that of light. The jets generate strong bursts of radio emission. As the "feeding rate" of the black hole varies, the levels of X-ray and radio emission change, in an interplay whose details are not yet fully understood. "This is, we think, the same mechanism at work in quasars at the cores of galaxies, where the black holes are millions of times more massive. However, in the smaller systems, things happen much more rapidly, giving us more data to help understand the physics at work," said Matthew Middleton, of the University of Durham in the UK and the Astronomical Institute Anton Pannekoek, in Amsterdam, Netherlands, leader of the research team. "Understanding how these things work is important, because we think quasars played a big role in redistributing matter and energy when the Universe was very young," Middleton added. The first microquasar was discovered in 1994, and several have subsequently been found, all within our own Milky Way Galaxy. "Obscuration within our Galaxy makes it difficult to study the disks of these microquasars in the Milky Way, but finding one in a neighboring galaxy means we probably can find many more, thus helping our efforts to better understand their physics," Middleton explained. The orbiting X-ray observatory XMM-Newton discovered the object, called XMMU J004243.6+412519, on January 15. The Swift and Chandra satellites then observed it regularly for more than eight weeks. The National Science Foundation's Karl G. Jansky Very Large Array (VLA) and Very Long Baseline Array (VLBA), along with the Arcminute Microkelvin Imager Large Array in the United Kingdom, studied the object at radio wavelengths. The behavior of XMMU J004243.6+412519 at both X-ray and radio wavelengths closely parallels the behavior of previously-discovered microquasars. In addition, the radio observations indicate that the emission from the object is coming from a small region. Even the supersharp radio vision of the VLBA cannot resolve any detail in the object. The VLA detected variations in radio brightness over the course of minutes, indicating that the emitting region is no larger than the distance between the Sun and Jupiter. "All these indications show that what we have found is, indeed a microquasar," Middleton said. The scientists estimate that the black hole probably is about ten times more massive than the Sun, and that its companion is a middle-sized, rather than a giant, star. Middleton and his colleagues on an international team published their findings in the scientific journal Nature. In a microquasar like the one newly discovered, a black hole with a mass several times that of the Sun pulls material from its companion star into a rapidly-rotating disk. The disk surrounding the black hole can become so hot it emits X-rays. The disk also propels narrow jets of subatomic particles outward at speeds nearing that of light. The jets generate strong bursts of radio emission. As the "feeding rate" of the black hole varies, the levels of X-ray and radio emission change, in an interplay whose details are not yet fully understood. A hypothesis I have about jets and why they vary has to do with the Electromagnetism and the mass ratio of the proton and electron. Because protons are much more massive, they are much harder to accelerate to velocities that could escape a black hole's accretion disk. This would cause a black hole to be more likely to be positively charged than negatively charged. The positive charge grows until it overwhelms the velocity difference..cont. By this I mean electrons with same kinetic energy of a proton should be moving at a relativistic velocity with about 6 additional "9's" in the decimal place compared to a proton with the same kinetic energy. So the protons initially fall into the event horizon sooner. However, once the black hole accumulates a large enough positive charge, then protons outside the event horizon can't fall into the event horizon as easily, BUT at this point, the positive charge of the black hole is now large enough to start capturing electrons just as easily as it was previously capturing the protons, because at this point the acceleration caused by electric charge has become strong enough to overwhelm the maximum velocity difference of the electrons, and so the Black Hole will oscillate between conditions of what I'd call "overcompensation" as the momenta of the objects being accelerated to the black hole doesn't stop in time for stop at a "neutral" charge. It over shoots. This oscillation would cause "flaring" of different types of radiation and polar jets, either temporarily reversing the charge in some cases, or in others just alternating between a minimum and maximum. The exact values and ratios of these charge fluctuations, and what the period required for the reversals or the maximum and minima, will be different for every black hole, depending on how massive it is and what it's surrounding stellar environment contains, and as that environment changes (runs out of material or in a void waiting on new material, etc,) these periods will change, so that the length of the periods is not exactly the same every time. This would cause a black hole to be more likely to be positively charged than negatively charged. The positive charge grows until it overwhelms the velocity difference.. Charge, Mass and Spin. These are what we can know about singularities. A charged black hole is a black hole that possesses electric charge. Since the electromagnetic repulsion in compressing an electrically charged mass is dramatically greater than the gravitational attraction (by something like 40 orders of magnitude), it is not expected that black holes with a significant electric charge will be formed in nature. I know that. In fact, I'm relying on it, if you read what I wrote more carefully, instead of being so eager to put a negative feedback vote. 1kg of electrically charged matter is enough to offset a planet's worth of gravity, but not a black hole's worth. To do that you need a few orders of magnitude more charged matter. What I was observing is that because protons are harder to accelerate they should fall into the black hole first. so you should have oscillations between charged and non-charged conditions, and this could cause flaring.